SPECIAL KARUPPATTI SWEETS ARE AVAILABLE. Sri Krishna Sweets much talked about 48 hours non-stop kondattam is scheduled to begin at 6 am on 27 October and will continue till 6 am on 29 October. This will take place at Venkatnarayan Road, Ashok Nagar, Mylapore. Adyar & Velachery outlets. made out of millet, Cashew & karuppatti. Sugar is not added and it is good for health. Those willing to gift their loved ones can buy gift boxes in new packaging and also you will find lot of gifting options with curated combos or gift coupons. These gift coupons can be redeemed at any of our outlets. There are gift cheques for those who wish to share their love with friends and relatives. The gift cheques are available in denominations of Rs.100, Rs. 200, Rs 300 and Rs 500. There are specially designed sweets boxes exclusively for this festive season. made out of Karupatti Laddu, Maaladdu, Coconut Laddu, Ellu Laddu (White and Black), Dry fruit Laddu, Rava Laddu are available. 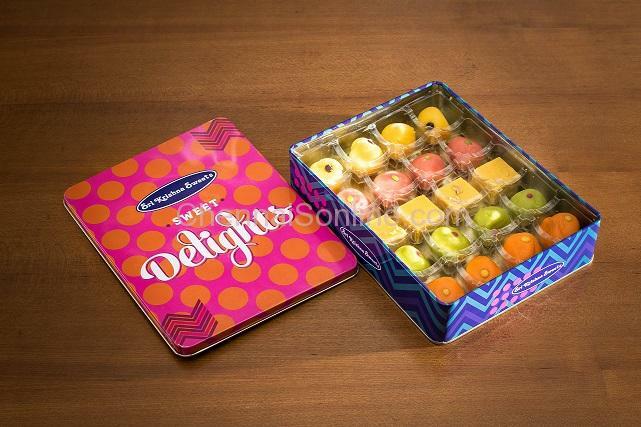 20 and 36 assorted sweets boxes that include varieties of laddus, Ghee sweets, Milk sweets and Cashew/Badam sweets are available for this diwali. Those visiting the Diwali Kondattam can never miss the ‘Dum Dum’ counter of Sri Krishna Sweets, an exclusive array of marriage sweets. Welcome Sweets, Muhurtham Sweets, Pandi Sweets and Thamboolam Sweets making marriage celebrations complete. Sri Krishna Food Products division from the house of Sri Krishna Sweets are prepared with the old conventional recipes in several new combinations. Its range includes Pickles, Podis, Vadam, Vathal, Thokkus and Paste and all displayed for your convenient to buy the products. Sri Krishna Foods spicy treat include pickles and thokkus that are hot and spicy while the podi is a rough powder usually made by grinding dried chillies and sesame seeds. They are delicious and go well with unsurpassable breakfast, the hot and fluffy idlies. The nine in one Idly Podi is a fast selling item. There are nine varieties of podi. Idly chilli podi, Daniya Idly Podi, Ellu idly Podi, Thirunelveli Idly Podi, Garlic idly Podi, asetofodia idly Podi, Pudina idly Podi, Sri Krishna Special idly podi and kollu idly Podi. These are an unbeatable combination for traditional South Indian spread. The most popular pure ghee made of cow’s milk is available in one kilogram, 500 gm and 200 ml packs. Recently introduced Kanjee Mavu with a combination of Ragi, Barely, Raw Rice, Cashew, Badam, Sago and fried gram is available in 500 gms and 200 gms pack is an extraordinary health supplement. Other very popular hot beverage, Sukumali Coffee is xavailable in 500 gm and 200 gm. Keerai varieties include Agathi Keerai, Murungai Keerai, Pongananganni, Mananthakali, Thuthuvalai, Vallaraai and Vendayam. In addition to pickles, many other dishes that hold a significant place in our hearts and households are also making their debut in Sri Krishnafoods. They are Puliyotharai, Garlic Rasam Paste, Vathal Kuzhambu Paste, MorKuzhambu Mix, Tamrind Rice Mix etc. These pastes when mixed with white rice make for a great lunch and are as tantalising as ever. Palm Candy Mixed Sukku Mali Coffee Podi, Badam and Cashew enriched Kanjee Mavu, Dhal Powder, Curry Leaf, Garlic Dhal Powder, Idli Kollu Millagai Powder, Idli Daniya Chilli Powder, Madras Sambar Podi, Madurai Rasam Powder, Paruppu Usilli Powder, Bajji Bonda mix, venpongal mix, naan roti mix, rava idly mix, pattanam pakkoda mix, rava dosa mix, ragi idly mix, masala vada mix, red rice puttu podi, bajra idli mix, payasam mix, cashew rava dosa mix, Vathal Kuzhambu Powder and Milagu Kuzhambu Powder are among the many bases that are getting introduced. You are definitely in for a delight as your taste buds are going to be treated in the best possible way. Kondattam at our Venkatnarayana Road, Ashok Nagar, Mylapore and Adyar. For Depavali Corporate booking and for the bulk booking contact : 1800 102 2343 or 42616161.